The original development of these came from crossing Silver Laced and Golden Laced varieties of Wyandotte's. After much work the Blue Laced Red was developed from this cross. 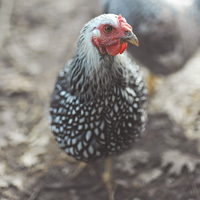 The Silver Laced Wyandotte is the original variety of the Wyandotte chickens with each silvery-white feather laced in a lustrous greenish black. Cold weather doesn't seem to bother them and hens keep laying through the winter. Columbian Wyandottes are an unusual and attractive variety. They have the same deep, well rounded bodies and close set comb of all Wyandottes, and are of medium size. Appearance is handsome with white bodies, and contrasting neck, tail, and wing plumage which are black with silvery white edging. 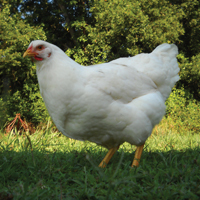 White Wyandottes are good brown egg layers, and are a wonderful dual-purpose breed. They can stand cold weather very well, and are excellent for northern climates. The hens are good brown egg layers. This variety is a beautiful combination of rich golden bay laced with lustrous greenish black. 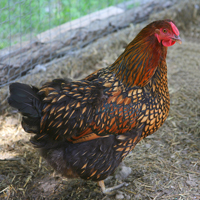 The general feather pattern is very similar to the Silver Laced Wyandottes.